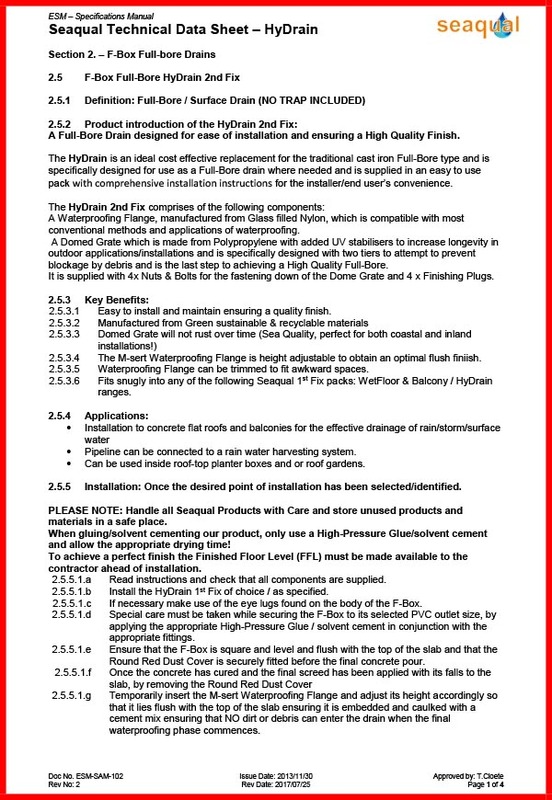 The HyDrain 2nd Fix comprises of the following components: A Waterproofing Flange, manufactured from Glass-filled Nylon, which is compatible with most conventional methods and applications of waterproofing. A Domed Grate which is made from Polypropylene with added UV stabilisers to increase longevity in outdoor applications/installations and is specifically designed with two tiers to attempt to prevent blockage by debris and is the last step to achieving a High-Quality Full-Bore. It is supplied with 4x Nuts & Bolts for the fastening down of the Dome Grate and 4 x Finishing Plugs. 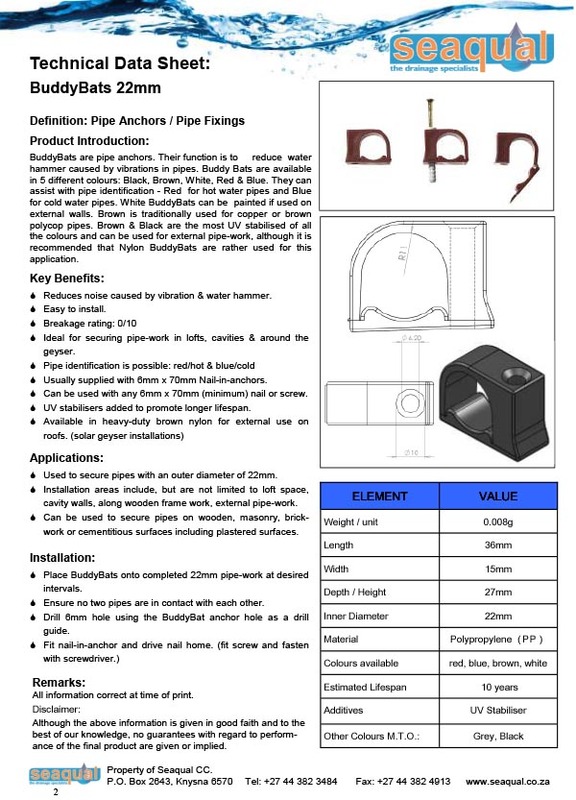 The HyDrain is an ideal cost-effective replacement for the traditional cast iron Full-Bore type and is specifically designed for use as a Full-Bore drain where needed and is supplied in an easy to use pack with comprehensive installation instructions for the installer/end users convenience. 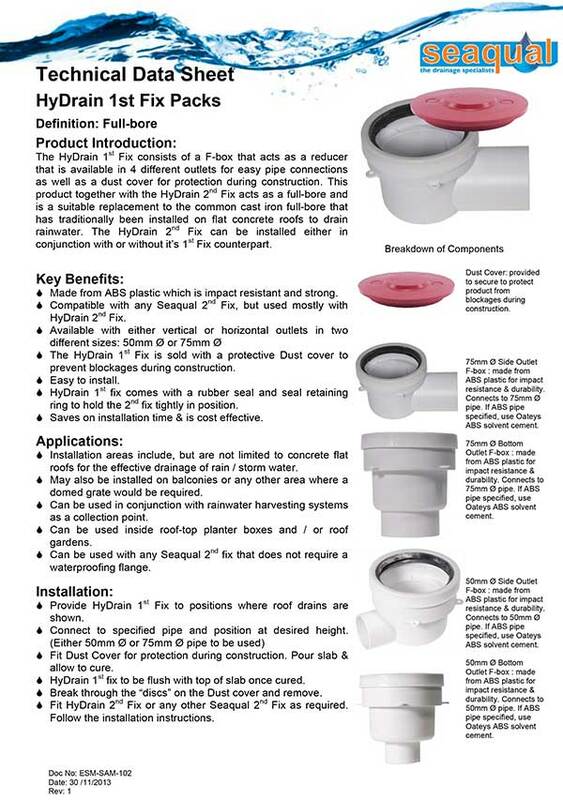 The HyDrain Complete comprises of the following components: The F-Box with a Retaining Ring (made from Hostaform) & Rubber Seal, forms the main body of the drain which houses components that produces a unique end-product and are available in both horizontal and vertical discharge points with two outlet sizes (50mm and 75mm). The F-Box is made from ABS (Acrylonitrile Butadiene Styrene) plastic for its durability and impact resistant properties. A Round Red Dust Cover which is made from HD-PE, is supplied for the protection of the F-Box during the construction phase. An M-sert Waterproofing Flange, manufactured from Glass-filled Nylon, which is compatible with most conventional methods and applications of waterproofing. A Domed Grate which is made from Polypropylene with added UV stabilisers to increase longevity in outdoor applications/installations and is specifically designed with two tiers to attempt to prevent blockage by debris and is the final step to achieving a High-Quality Full-Bore. It is supplied with 4x Nuts & Bolts for the fastening down of the Dome Grate and 4 x Finishing Plugs. 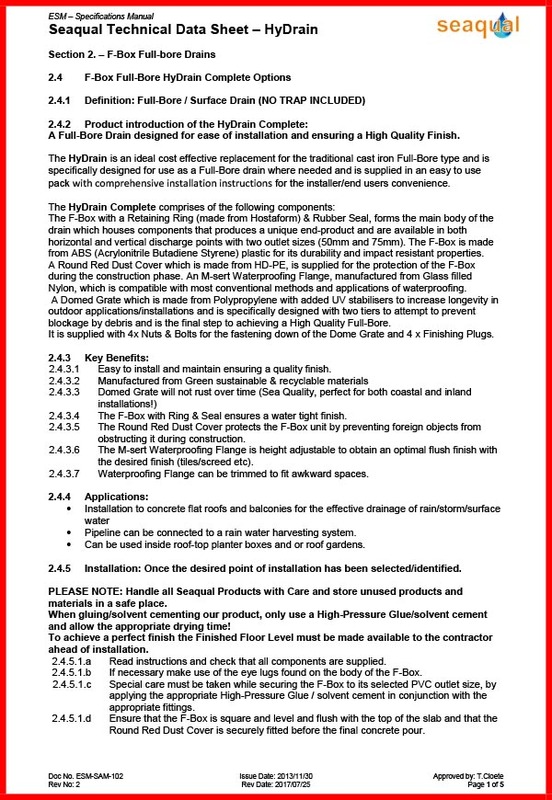 2.4.3 Key Benefits: 2.4.3.1 Easy to install and maintain ensuring a quality finish. 2.4.3.2 Manufactured from Green sustainable & recyclable materials 2.4.3.3 Domed Grate will not rust over time (Sea Quality, perfect for both coastal and inland installations!) 2.4.3.4 The F-Box with Ring & Seal ensures a watertight finish. 2.4.3.5 The Round Red Dust Cover protects the F-Box unit by preventing foreign objects from obstructing it during construction. 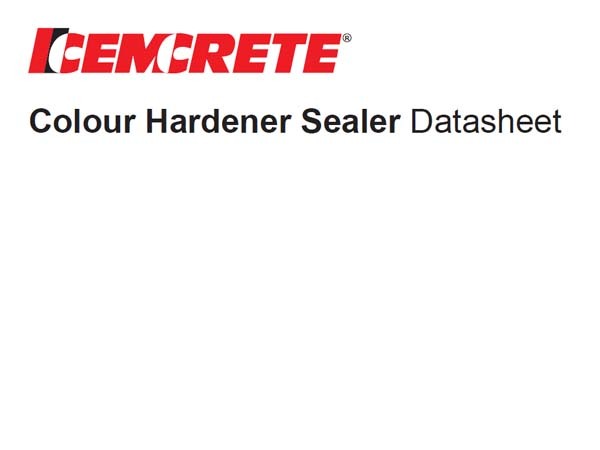 2.4.3.6 The M-sert Waterproofing Flange is height adjustable to obtain an optimal flush finish with the desired finish (tiles/screed etc). 2.4.3.7 Waterproofing Flange can be trimmed to fit awkward spaces. 2.4.4 Applications: ? 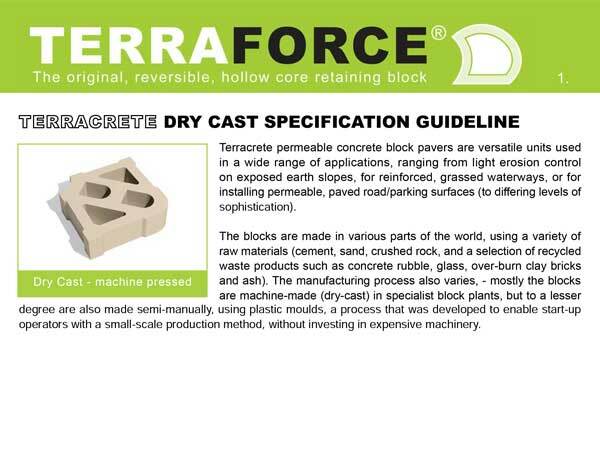 Installation to concrete flat roofs and balconies for the effective drainage of rain/storm/surface water ? The pipeline can be connected to a rainwater harvesting system. ? Can be used inside roof-top planter boxes and or roof gardens. 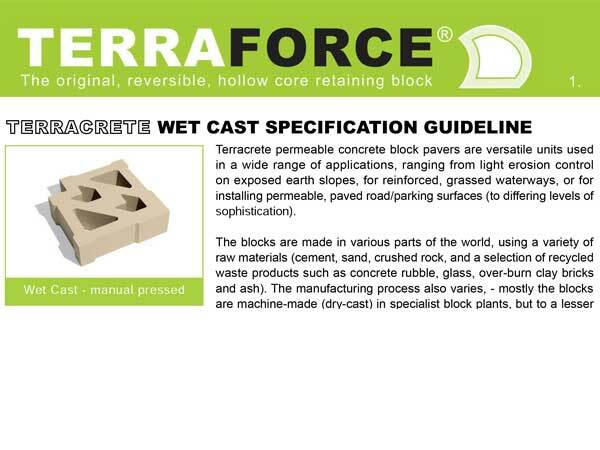 Terracrete permeable concrete block pavers are versatile units used in a wide range of applications, ranging from light erosion control on exposed earth slopes, for reinforced, grassed waterways, or for installing permeable, paved road/parking surfaces (to differing levels of sophistication). BuddyBats are pipe anchors. Their function is to reduce water hammer caused by vibrations in pipes. Buddy Bats are available in 5 different colours: Black, Brown, White, Red & Blue. They can assist with pipe identification – Red for hot water pipes and Blue for cold water pipes. White BuddyBats can be painted if used on external walls. Brown is traditionally used for copper or brown polycop pipes, or to attach to roof trusses. Brown & Black are the most UV stabilised of all the colours and can be used for external pipe-work, although it is recommended that Nylon BuddyBats are rather used for this application. BuddyBats are pipe anchors. Their function is to reduce water hammer caused by vibrations in pipes. Buddy Bats are available in 5 different colours: Black, Brown, White, Red & Blue. They can assist with pipe identification – Red for hot water pipes and Blue for cold water pipes. White BuddyBats can be painted if used on external walls. Brown is traditionally used for copper or brown polycop pipes. 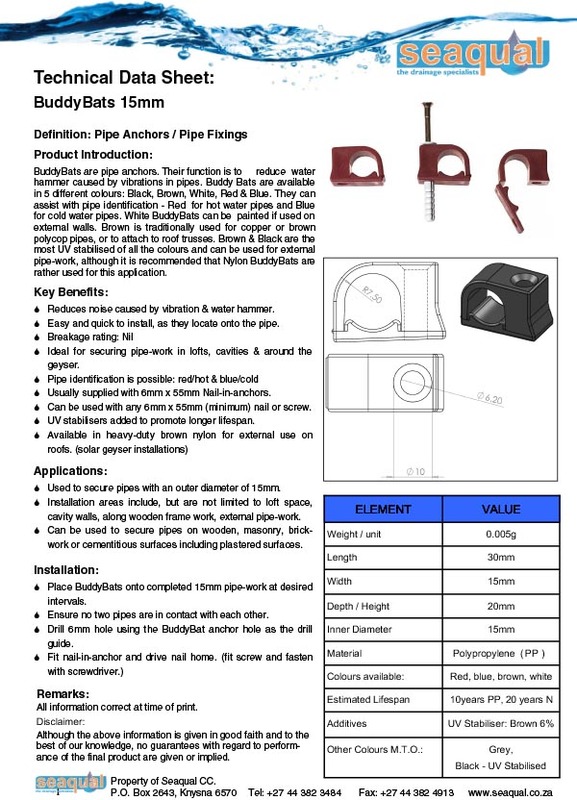 Brown & Black are the most UV stabilised of all the colours and can be used for external pipe-work, although it is recommended that Nylon BuddyBats are rather used for this application. 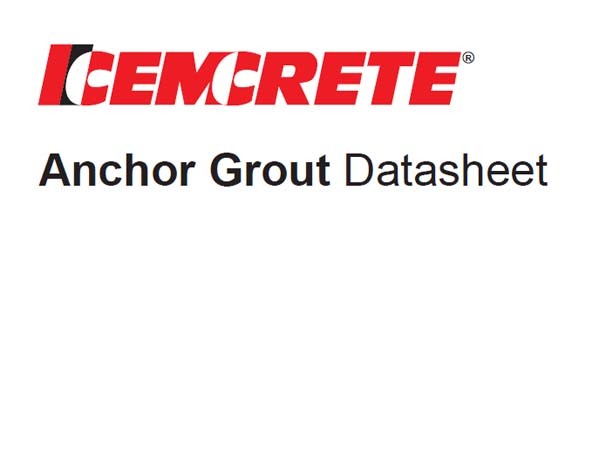 Anchor Grout is a rapid set ready-for-use (merely add water) Portland cement-based grouting compound. It contains chemical reagents which prevent shrinkage during curing. The HyDrain 1st Fix consists of a F-box that acts as a reducer that is available in 4 different outlets for easy pipe connections as well as a dust cover for protection during construction. This product together with the HyDrain 2nd Fix acts as a full-bore and is a suitable replacement to the common cast iron full-bore that has traditionally been installed on flat concrete roofs to drain rainwater. A non-yellowing clear, thermoplastic acrylic lacquer-based resin which displays excellent UV stability. Has very fast solvent release, i.e. drying properties. The sealer greatly enhances the colour and protects the surface from the ingress of dirt and grease. 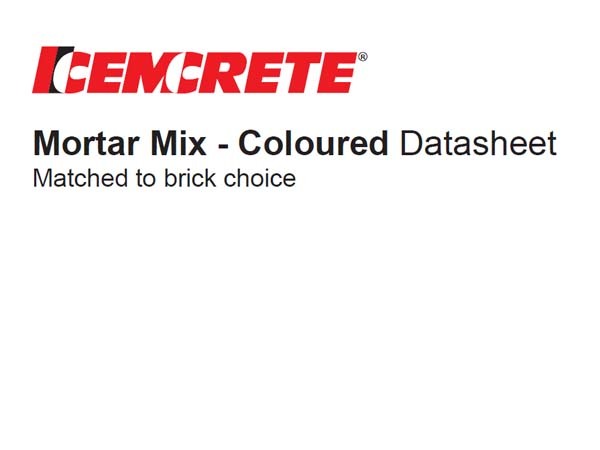 A coloured masonry Mortar Mix comprising white cement, graded sand and certain additives to give high bond strength, waterproof joints and high water retention for workability and plasticity. Good water retention gives improved bond and bleeding characteristics. Also has excellent water absorption qualities. A granolithic concrete material that is floated into fresh screed or concrete which colours, strengthens and creates durable surfaces for concrete floors. 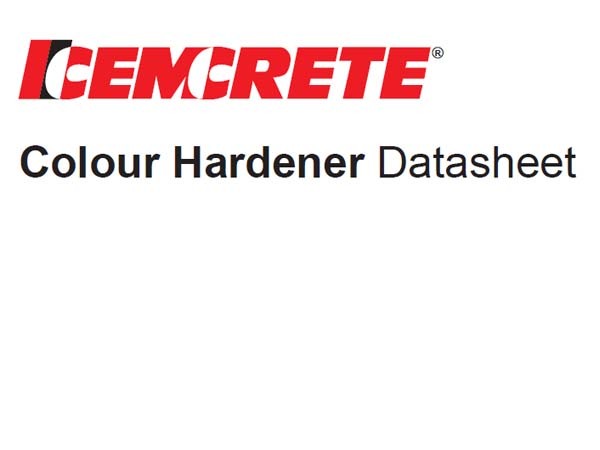 It is a special blend of cement incorporating very hard-wearing aggregates, lightfast pigments and certain additives which set rock-hard and which has exceptional abrasion resistance. Some cement floor finishing experience is required for the success of this application.